After I tortured you, absolutely tortured you, with a great interview with Ruth Clemens, baker extraordinaire who blogs at The Pink Whisk, and now author of Creative Eclairs: Over 30 Fabulous Flavours and Easy Cake Decorating Ideas for Eclairs and Other Choux Pastry Creations . But I didn't give you even a hint of a recipe, I just talked about how great they were. Well, I am going to remedy that, sweet readers, because Ruth has been kind enough to share a recipe from the book, for Tropical Fruit Medley Eclairs. It being that I am in Bali at the moment, it seemed like an appropriate recipe to share. Enjoy! 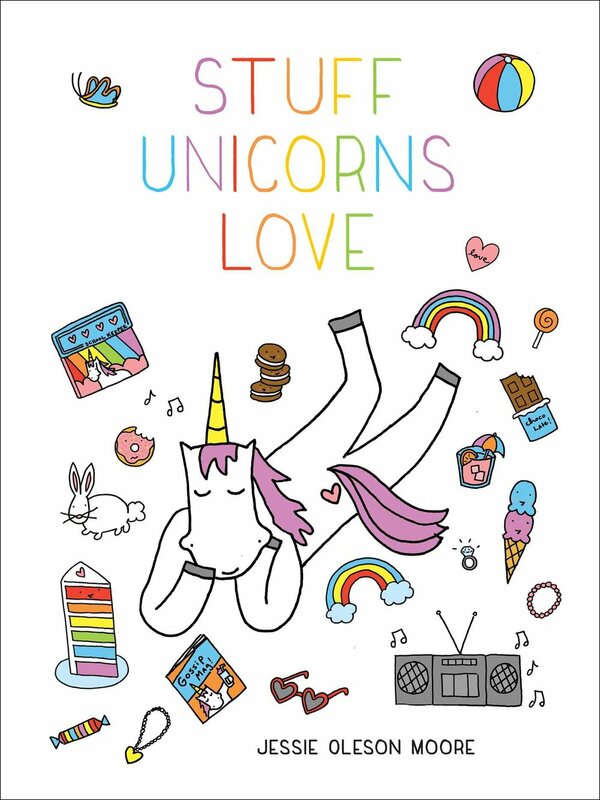 This is part 2 of my entry as part of the book tour blog hop; to see the other entries, click here. Preheat the oven to 160°C (fan)/180°C/350°F/Gas Mark 4. Fill a piping (pastry) bag fitted with an 18mm (3/4in) nozzle (tip) with the chilled choux pastry. Pipe 15cm (6in) éclairs onto a baking sheet lined with non-stick baking (parchment) paper or a silicone liner (bake-o-glide). Spray the éclairs lightly with vegetable or sunflower oil and bake in the oven for 50 minutes until golden brown. Transfer to a wire rack and allow to cool completely. Roll out the yellow sugarpaste and cut out two medium-pointed five-petal blossoms for each éclair. Roll out the lime green and cut one small blossom for each. Using a cocktail stick (toothpick), imprint lines along each petal. Set the yellow blossoms on top of each other, slightly offsetting the petals, and place the green blossom in the centre. Carefully pick up the pieces and pinch together gently from the back to ruffle the petals. Set aside to dry in the recesses of an egg box. Assembly: Whisk the prepared tropical crème patissière with an electric hand mixer until smooth. Split each éclair with a sharp serrated knife (see Filling, Dipping & Splitting) and spoon the tropical crème patissière into the base of each. Top the crème patissière with a mix of sliced tropical fruits. Warm the orange fondant glaze gently until of a dipping consistency and place in an open shallow bowl. Dip the top of each éclair in the fondant to coat and place on top of the fruit filling. Apply a dab of water to the centres of the flowers and sprinkle on the dragées. 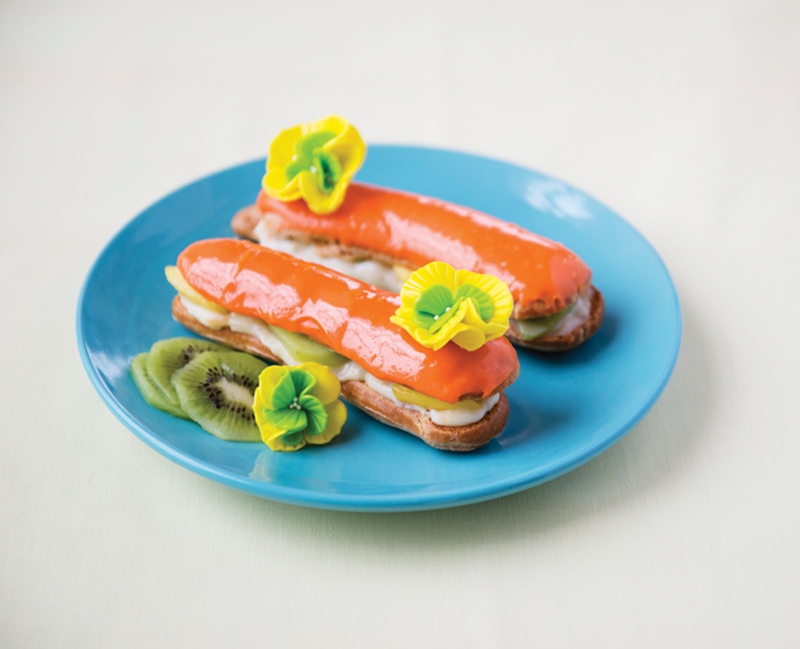 Add a tropical flower to the top of each éclair and serve. Omit the vanilla and replace with the grated zest of 1 lime, half an orange and half a lemon. Before transferring to a bowl to cool, whisk in 15ml (1 tbsp) coconut liqueur. In a large jug whisk together the egg yolks and caster (superfine) sugar until the mixture is light and foamy. Add the cornflour and whisk again until of an even consistency. Set to one side. Place the milk and vanilla in a medium pan and heat gently until just below boiling point. Whilst whisking the egg mixture continuously, add the warmed vanilla-infused milk a little at a time until both mixtures have been fully worked together. TIP: Make sure you whisk together the egg yolks as soon as the caster (superfine) sugar is added to them. This will prevent the sugar from pulling the moisture out of the yolks, which could result in ‘egg burn’, where you would have yellow flecks in your finished crème patissière. Transfer the mixture back to the pan and over a medium heat, whisking continuously, bring to the boil. Continue to cook the crème patissière for 2 minutes until thick and glossy. Remove the pan from the heat and transfer the mixture to a bowl. Contact-cover the top of the crème patissière with cling film (plastic wrap) to prevent a skin from forming, and allow to cool. Refrigerate once cooled. When you are ready to use it, transfer the chilled crème patissière to a large bowl and beat with an electric hand mixer until it is a smooth and even consistency. Break the fondant into small pieces and place in heatproof bowl with the water. Heat gently in the microwave in short bursts, or over a pan of steaming water, stirring frequently, until the fondant melts. Mix with an electric mixer until the consistency is smooth and even and no lumps remain. The glaze will begin to set while it cools, so use while it is still warm. It can easily be reheated to pouring consistency if it cools too quickly for use. TIP: Fondant glaze can be coloured with food gel pastes and easily flavoured with a wide range of extracts. Simply add a small amount of gel paste colour in the required shade to warmed fondant that is ready to be used. Make sure that it is evenly mixed to avoid any streaks before using to coat the tops of éclairs. TIP: The temptation is to add more water to keep the fondant in a liquid state but if you do this the fondant will not set once the éclairs are coated. Gently warming the fondant before use is the best method. Add the grated zest of 1 orange in 30ml (2 tbsp) hot water before adding to the fondant and heating together.